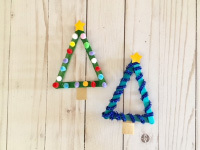 This Popsicle stick Christmas tree craft is so much fun! My kids loved choosing what color they wanted their tree to be and deciding how to decorate it. 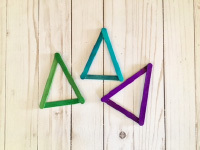 Cut a small piece off one side of the Popsicle sticks so it will be easier to create more of a tree shape once they are glued together. 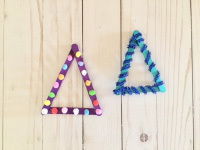 Glue three Popsicle sticks together to make a tree shape for each child to decorate. Cut rectangle shapes out of the brown construction paper to create Christmas tree trunks. 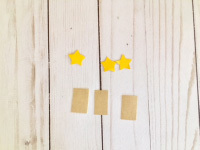 Cut star shapes out of the yellow paper. Have children decorate their tree with pompoms and chenille stems as they wish. 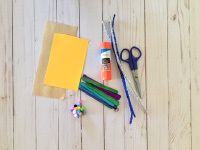 Use glue or glue sticks to keep the pompoms in place. Have children glue a construction paper trunk and a star on their Christmas tree. A string could also be attached to the back of each tree, at the top, so they can be hung as decorations.